New restaurant set to open in Scottsdale this fall. Those eager to bite into one of White Castle's sliders have to wait a bit longer (but not too much longer) before the chain opens its first restaurant in Arizona. The chain known for its 2"x2" sliders is expected to open in the fall at The Block at Pima Center, a 22-acre mixed-use development near the Loop 101 and Via de Ventura, part of the Salt River's Talking Stick Entertainment District. 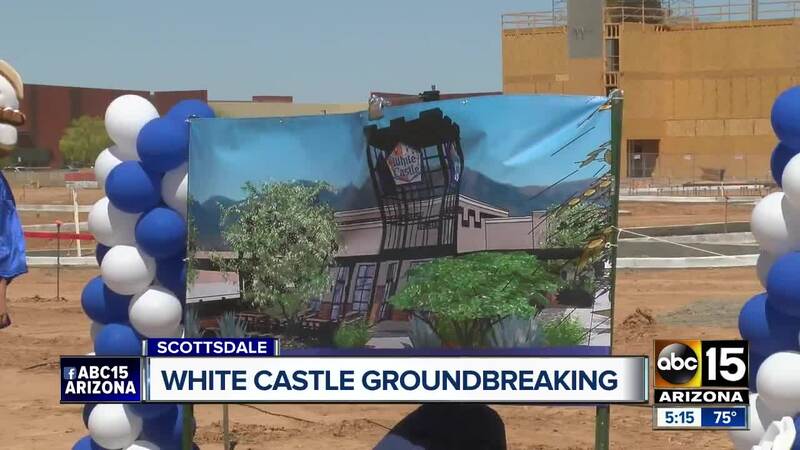 On Wednesday morning, officials with White Castle, the Salt River Pima-Maricopa Indian Community and Hall of Fame rocker -- and apparent longtime White Castle fan -- Alice Cooper held a ground-breaking ceremony at the future site. We just got a few more updated renderings of what the White Castle restaurant will look like. The 4,589-square-foot restaurant will be the largest stand-alone location that White Castle has. It will have an 1,100-square-foot patio with seating for up to 50 people, according to a news release. It will also have an area known as "Alice Cooper's corner" where a photo of the rocker will be hung. The photo is of Cooper seated on a throne with dozens of slider boxes stacked behind him. A replica photo was presented to Cooper during the ceremony. Cooper was inducted into White Castle's "Cravers Hall of Fame" in 2014 , three years after he was inducted into the Rock and Roll Hall of Fame. "Being born in Detroit, it was a staple part of your diet," Cooper told ABC15. He said his dad would bring sliders home when he was a kid. "We loved them. They were like addictive, like eating potato chips. You couldn't stop eating them," he said. The restaurant is expected to bring 50 to 80 new jobs to the area. It is one of three additions coming to the Salt River's Talking Stick Entertainment District. Down the street, construction crews are working on Medieval Times, the rambunctious dinner theater and jousting tournament that slated to open sometime this summer. An opening date has not yet been announced. Near Salt River Fields at Talking Stick, Great Wolf Lodge is under construction . The 350-room hotel and 85,000-square-foot indoor water park will open on Oct. 17, 2019.